In ufology, a sighting is an incident involving the observation of a UFO. The word sighting itself can also be used to denote a sighting report. The two contexts have widely different connotations. Contrary to skeptical opinion, seeing some vague unidentified light or object off in the distance does not qualify as a UFO sighting. Official USAF definitions and common usage both share the idea that in order to qualify as a UFO, the object must be seen well enough to give the observer sufficient reason to believe that they're looking at something that doesn't correspond to anything natural or manmade. Official definitions also make it clear that vague lights off in the distance that could be aircraft or other known objects should not be reported as UFOs. In contrast, UFO reports may or may not be composed of such descriptions and therefore it cannot be presumed that every UFO report represents a UFO sighting. Credit for addressing this problem can first be attributed to astronomer J. Allen Hynek and astrophysicist Jacques Vallee who began cataloging UFO reports according to a specified set of criteria. Over the years their systems merged and evolved into the UFO sighting classification systems used today. Throughout human history people have seen strange things flying in the sky. The earliest reports have been passed down through the ages in myth, legend and religion. For example in ancient Egyptian mythology ( circa 1800 B.C. ), the God Aten is usually interpreted to be a deification of the Sun itself. However further details describe Aten as a disk or sphere, and that it's bright appearance although likened to that of the Sun was not the Sun itself, but a separate object that carried their God within it. Proponents of the AAH also point to The Story of Sinuhe, which describes a deceased Egyptian King being lifted up into the "Sun Disk" to become one with it. Therefore the Sun Disk is a simile, not unlike the Thunderbird of North American native mythology, which is not simply a deification of thunder, but a reference to a legendary bird with illuminated eyes and large wings that produced the sound of thunder as it flew. The origin of the Thunderbird myth is not clear, but references to it are found in multiple tribes, the history of which date back over 10,000 years within North America. Biblical references include the prophet Ezekiel, who during July of 592 BC was approached by metallic flying wheels carrying living creatures. Tales of ancient conquests by Alexander the Great describe three instances between 329-337 BC when he and his army encountered flying silver disks of various sizes.1 The Roman author Julius Obsequens who lived during the fourth century AD reported that in 216 BC a round shield was seen flying over Apulia about 273 kilometers east of Rome. The dawn of the 1st millennium, and the point at which our primary international civil calendar ( the Gregorian Calendar ) is calibrated, was heralded in by a brilliant flying "star" that hovered over the Palestinian town of Bethlehem, the birthplace of the Christian deity Jesus. The historian William of Newburgh who wrote during late 12th century AD, reported that a silver flying disk frightened many people near the Byland Abbey, which was located in the Ryedale district of North Yorkshire, England. It wasn't until the Modern Era of ufology that people began to seriously study the phenomenon using modern tools and methods. During June of 1947, civilian and military pilots began reporting strange objects flying over the continental United States. The United States Air Force began studying the reports and in January 1948 launched Project Sign. The project's first summary was based on data from 243 domestic sightings and 30 foreign incidents, and at no time were religious manifestations or supernatural causes considered as possible explanations. Instead, all sighting reports were analyzed by serious academics and trained investigators including those from the FBI, RAND Corporation, the USAF Scientific Advisory Board and Ohio State University. Flying disks i.e., very low aspect ratio aircraft. Torpedo or cigar shaped bodies with no wings or fins visible in flight. For the unexplained sightings every plausible explanation was considered, but ultimately, for some sightings there was only one explanation that made sense to Project Sign investigators. In August of 1948, they drafted a Top Secret Estimate Of The Situation in which they concluded that some UFOs represent extraterrestrial technology. However the Estimate was ultimately rejected by the USAF hierarchy because it lacked physical evidence. It was subsequently ordered destroyed and the repercussions led to a schism of belief with proponents of the ETH on one side, and UFO deniers on the other. However that was far from the end of official UFO investigations. From the aftermath further projects arose that would ultimately span over 20 years and remain equally controversial. Later sources in the USAF have stated that the number of unknowns was actually only five percent, and skeptics often use those numbers to claim that statistics like those above are not accurate. However what the skeptics are missing is that later numbers are based on efforts by the USAF to downplay the significance of UFOs. This is not to say that the USAF fabricated large numbers of explained sightings after the fact. Rather, whereas analysts had initially excluded irrelevant and useless data, the post Robertson Panel spin doctors began including everything and anything no matter how trivial, thereby lowering the percentage of Unknowns. Period documents from the NARA archives also reveal that multiple reports often refer to a single incident. By including them in the results, the number of reports is also artificially inflated leading to a different statistical outcome. Furthermore, in support of the accuracy of the evaluation chart for 1947-1952 ( above ), the data was provided by Captain Edward J. Ruppelt, who was the actual USAF officer in charge of Project Blue Book until late in 1953. 3 By contrast, later sources have rarely actually been involved in any UFO investigations and simply quote the standard USAF press release, not because it is accurate, but because it's become standard procedure. Given these factors it is logical to believe that the early untainted data from the original source is the most trustworthy. Astronomer Josef Allen Hynek was the primary astronomical consultant to Project Sign and Project Blue Book. Using objective data obtained from official USAF reports, he distilled sightings into classes of hierarchical significance according to three subtypes, each with three levels of intensity, for a total of nine types of sightings. He called these kinds of sightings close encounters. According to Hynek's 1974 book, The UFO Experience, A Scientific Enquiry, a close encounter is a UFO sighting where the object is close enough to show appreciable angular extension and considerable detail, in which stereoscopic vision is effective and physical contact with the object is considered a real possibility. Strictly speaking, because human stereoscopic vision is limited to a range of about 3 meters, a close encounter would mean that the UFO would have been within 3 meters of the observer. Therefore it is generally accepted that the intent of Hynek's definition is to ensure that there are enough visual cues by which to gauge the size and distance of the UFO with reasonable accuracy. Generally this means the UFO would be within a few hundred feet of the observer. However if a larger UFO passes between the observer and a more distant landmark, the sighting can still be classed as a close encounter. Nocturnal Light ( NL ): An anomalous flying light usually seen at night. Daylight Disk ( DD ): A disk shaped UFO observed during daylight . 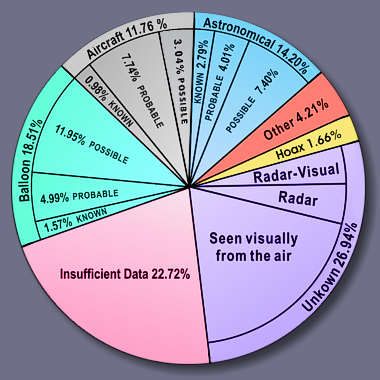 Radar Visual ( RV ): A UFO tracked on radar while visually observed. First Kind: UFO seen close-up or between the observer and a landmark. Second Kind: Interaction between the UFO and the environment. Third Kind: Observation of animated entities ( aliens ). Type 2: Unusual cigar shaped clouds, mostly over France during 1954. Type 3: UFOs that change direction and/or speed. Type 4: UFOs that did not change direction or speed. After his UFO work with the USAF, Hynek went on to found the Hynek Center For UFO Studies ( CUFOS ) and in 1972 he published The UFO Experience, A Scientific Inquiry. Vallee also continued his research into the UFO phenomenon and in 1990 published Confrontations, in which he expanded on the Hynek system by organizing sightings into four main types consisting of five sub-types each. This system is very useful in cataloguing the vast majority of UFO reports. A significantly unusual object observed without visual aid or cues that can be used in determining the object's distance, size or speed. Such objects could be within a few hundred yards, or as far away as a planet, but there is no way to tell with certainty. A significantly unusual object that flies past the observer without changing direction. Given the duration of the sighting and relative size of the object, some rough estimates can be made of the object's distance, speed and size. A significantly unusual object that changes course as it passes by the observer. A discontinuous trajectory indicates the object is utilizing a flight control system and is not a natural phenomenon such as a meteor or comet. A significantly unusual object that passes between the observer and a landmark or other visual cue of discernable distance, thereby enabling a close estimate of the object's size and speed. In the best cases, surface details of the object are also visible. The Hynek/Vallee subsets consist of the Hynek CE-1 through CE-3 series plus two more that include mental and physical phenomena or consequences resulting from the experience. For example, communication with an animated entity in close or discernible proximity to the witness would be classed as a CE-4 and personal physical injury resulting from a close encounter would be classed as CE-5. The system allows 20 sighting types to be catalogued using a 3 character alphanumeric code. First: Limited to visual observation only. Second: Includes lasting environmental interaction or disruption. Third: Includes observation of animated entities ( aliens ). Fourth: Includes interaction with animated entities ( aliens ). Fifth: Includes positive or negative physical changes to the witness. NOTE: Vallee originally described a CE-4 as "reality transformer", in which the nature the of the experience is so psychologically overwhelming as to either evoke, or leave the experiencer vulnerable to the insertion of new thoughts and visual experiences. Although a UFO experience can have profound effects on the paradigms of reality held by those who have never experienced it, a close encounter of the fourth kind is still the result of interaction with alien entities, and it is generally accepted that the CE-4 classification is meant to cover any physical or psychological interaction that does not cause lasting physiological changes to the experiencer. The Hynek/Vallee System became the standard among most ufologists for the classification of individual UFO sightings. Hynek and Vallee also refined the process further by developing systems that rate the nature and believability of a report itself. USI has since refined both of these schemes and added a new category to accommodate mnemonic factors. The Hynek, Vallee and USI confidence rating systems are outlined below. Hynek ascribed a strangeness (S) and probability (P) rating to each report. Strangeness is how much the experience is different from everyday life. Probability refers to the amount of confidence that a report portrays actual events. The ratings are on a scale from 1 through 9. The lowest rating possible under Hynek�s system is S1/P1 and the highest S9/P9. Uncorroborated reports were not allocated a probability rating above 3. Reports that contained a lack of internal consistency were also rated low on the scale. Multiple reports from independent witnesses that all refer to a single incident and describe the same thing are rated higher. Lower rated sightings consist mainly of nocturnal lights and daylight disks. Higher rated sightings are usually CE-2 and CE-3. Apart from these general guidelines, there is no prescribed criteria from which to construct a rating. Vallee expanded on the Hynek system by creating a rating system based upon source reliability (S), visit to the location of sighting (V) and probability of a conventional explanation (P). He called it the SVP rating system and assigned each category a five level numerical hierarchy, 000 being the lowest, 444 being the highest and 222 being the median. The higher the number the greater the reliability of the report and the less likely it could be explained as a conventional or natural phenomenon. Ufologists are no longer dealing exclusively with nuts and bolts phenomenon. Things such as channeling, astral projection, dream states, hypnosis and other forms of altered consciousness are now taken seriously by some researchers. To address this issue, USI does not arbitrarily reject such experiences. Rather, USI maintains that the information is generally unreliable in reference to the material world and needs to be taken in the proper context. For example, although a person may clearly recall the content of a dream or offer information under hypnosis, both types of data are the result of unconscious processes. Therefore although an event may have taken place in the mind of a witness, a direct correspondence between the data provided by the witness and material reality needs to be established before the event can be taken seriously. USI confidence ratings use the same three categories as the Vallee SVP system plus a mnemonic rating for the type of memory a UFO report is composed from. This makes four categories ( SVPM ), each having five levels of confidence from zero through four. The higher the rating is, the more credibility it is assigned. Hence the lowest possible rating is 0000, the highest is 4444 and the median is 2222. 0 Unknown or unreliable or fabricated source. 1 Known source of unspecified reliability. 2 Reliable second hand source. 3 Reliable first hand source or multiple corroborated sources. 4 First hand report by interviewer of proven reliability. 0 Site not visited or not possible to visit as it does not seem to exist. 1 Site visited by person who is unfamiliar with phenomenon. 2 Site visited by person who is familiar with phenomenon. 3 Site visited by a trained and experienced observer. 4 Site visited by a skilled analyst or certified UFO investigator. 0 Easily explained as natural or conventional or a hoax. 1 Explainable by slight alteration of data. 2 Explainable by significant alteration of 1 piece of data. 3 Explainable by significant alteration of multiple issues. 4 Explanation as natural or conventional not possible. 0 Experienced in an altered state - no correlation. 1 Experienced in an altered state - minimal correlation. 2 Assisted recall ( hypnosis ) with fair correlation. 3 Conscious experience & recall of an event more than 5 years old. 4 Clear conscious experience & recall of a recent event. Although the USI confidence rating system clearly downplays the relevance of altered states of consciousness in validating UFO sightings, USI does not dismiss them altogether. In the event that someone can repeatedly demonstrate that there exists a correspondence between their altered state and an objective reality, they deserve to be taken seriously. The USI overall confidence rating is based on the average of the SVPM score ( S+V+P+M divided by four ). It is useful for quickly identifying the overall quality of a report. F Fabrication Contradictory and unverifiable data. H Hoax Proven intentional fabrication. If a remote viewer says there are alien bases on Venus, few ufologists are going to pay much attention to the report. However USI believes that it is possible for certain PSI related reports to contain valuable data. Therefore USI has constructed a classification system that correlates data between objective UFO experiences and PSI phenomenon. The tables below outline six groups of PSI related experiences coupled with a score between 0 and 3 based on the USI overall confidence rating. So, for example, an H-3 rating would indicate a very high confidence hypnosis session backed by independent objective data. T Telepathic including channeling and remote viewing. R Revelation including archetypal religious experience. A Astral or OOBE ( A seemingly conscious and realistic dream state ). D Dreamstate ( Lucid or Typical Dreaming ). 0 No Data or Unsubstantiated with a 0-1 star SVPM. 1 Some Data Substantiated with a 2-3 star SVPM. 2 Significant Substantiation with a 3-4 star SVPM. 3 Objective Substantiation with a 4-5 star SVPM. 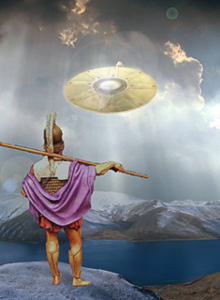 The UFO in the artist's rendition ( top left ) depicts an ancient "flying shield" as described in ancient Greek and Roman mythology.